Ever since my previous visit to Flume Creek Canyon (account here), I had wanted to return and explore more of it. I had to turn around due to darkness on that previous venture. I had also visited the area once more after that, taking the grueling 14.5 mile trek in and out of Rattlesnake Canyon (account here). But I had always promised myself to return during cooler months to explore. Well, it was January and that counts as one of the cooler months as far as most are concerned, well, unless you live in the southern hemisphere. I was looking to get out and do a bit of exploring and recruited my coworker Shannon to come along. We decided upon a tour of the Flume Creek area by way of the Pollock Bench. There were three choices for us: A four mile, up and down Flume Creek Canyon trek, a six mile, up the bench, out the canyon trek and a seven and a half mile Pollock Canyon Rim and out Flume Creek route. We decided upon the middle one due to time constraints. It wasn't a stunningly gorgeous day by any means. 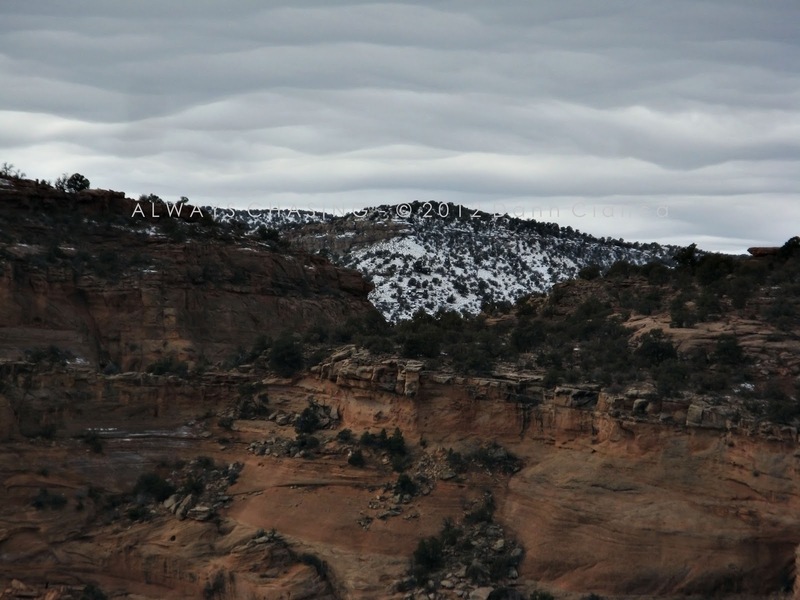 A mid-level cloud deck curved over the terrain of the Uncompahgre Plateau. It just felt good to be outside. 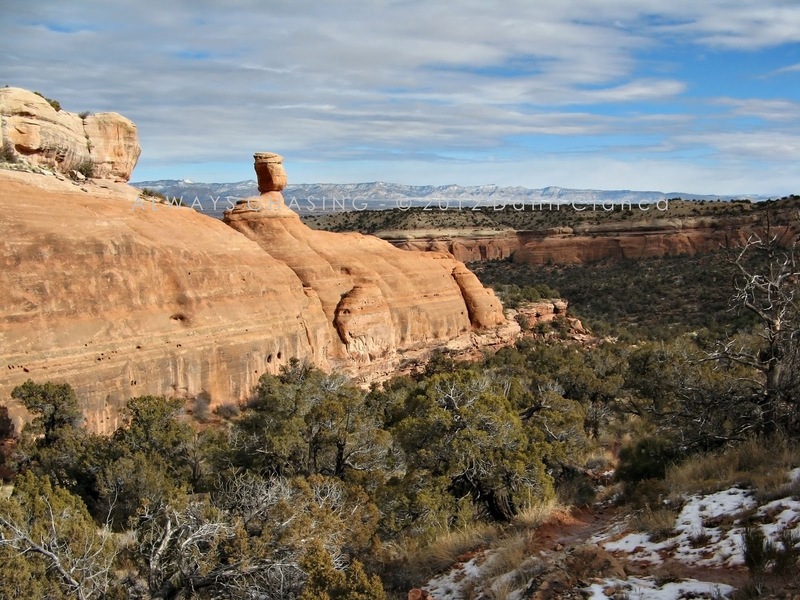 About the Uncompahgre Plateau, it is a large area of geologic uplift that stretches from the Colroado River near Grand Junction at its northern most point to the San Juans to the south. 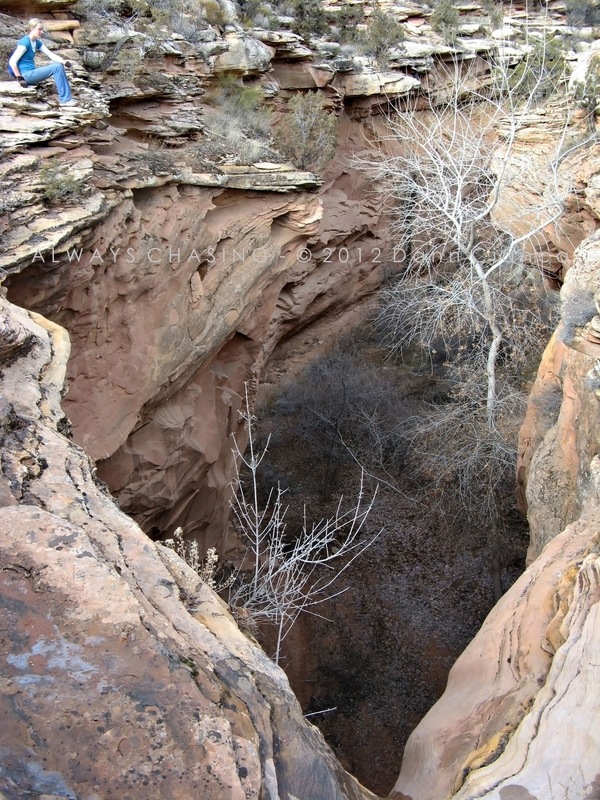 Along the northern edges, deep canyons are cut into the sandstone and most of this area is part of the McInnis Canyons National Conservation Area. I talk about it enough that I ought to show a diagram. I found the image below here. 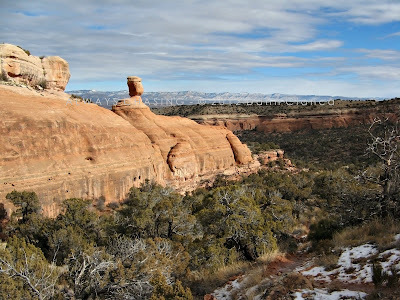 We made it to the trail head by late morning and were soon ascending out of the wide expanse of the Flume Creek drainage onto the Pollock Bench. Once atop, the bentonite clay trail became extremely muddy and slowed us down some. We were in good spirits about it however, and continued on, trying not to fall. The trail through the center of the bench winds through Piñon-Juniper with occasionally tremendous views of the Grand Valley to the east, Pollock Canyon to the west and the Black Ridge to the south. Eventually, we started coming close to the edge of the bench and were afforded a decent view of Pollock Canyon. I hadn't even really thought about my camera yet since the light was bad and we were walking into the sun. However, at an overlook, I noticed a turbulent pattern in the bottom of the cloud deck. 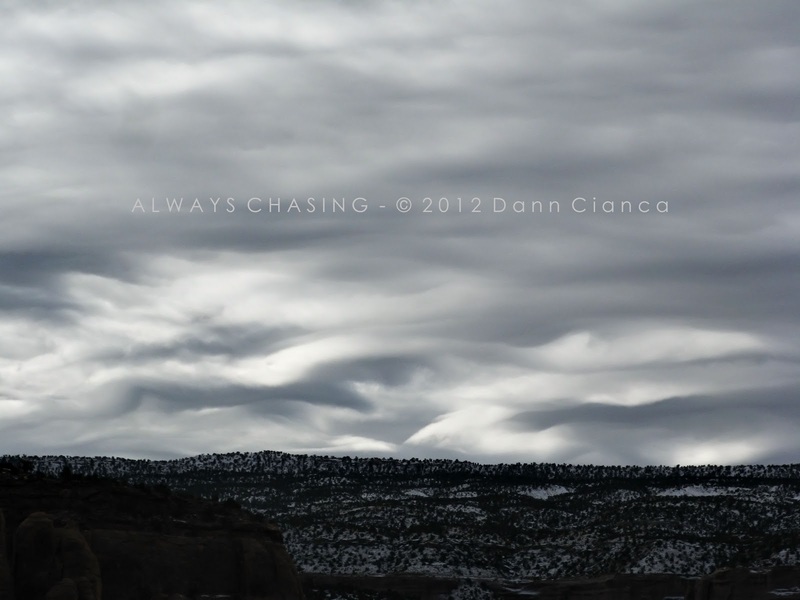 It almost appeared to be a weak version of the as of yet unofficial undulatus asperatus. So, of course, I started snapping away. How could I pass up a meteorological moment? 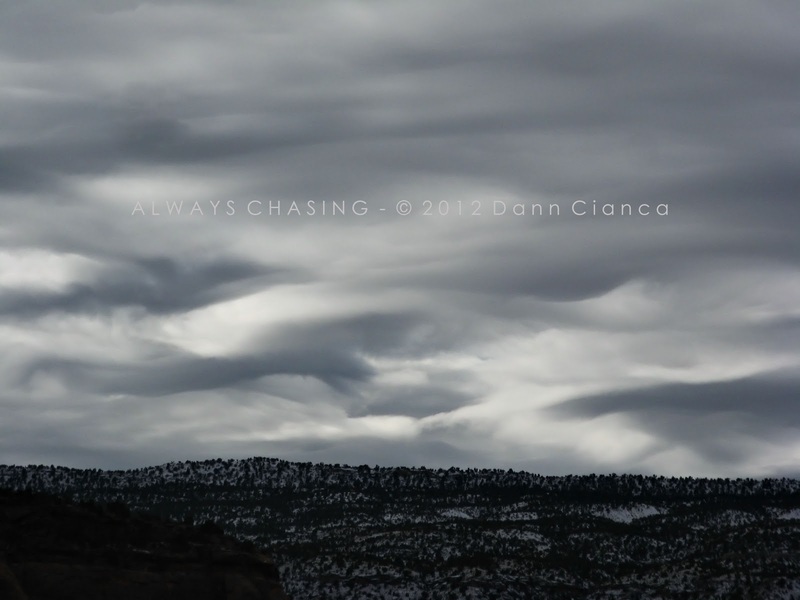 Shannon is studying meteorology, so she was also quite intrigued by the clouds. It was a nice surprise for us on an otherwise overcast day. The sun did try and peek out a couple of times, however and did for a moment while were standing there; though it was a little filtered. 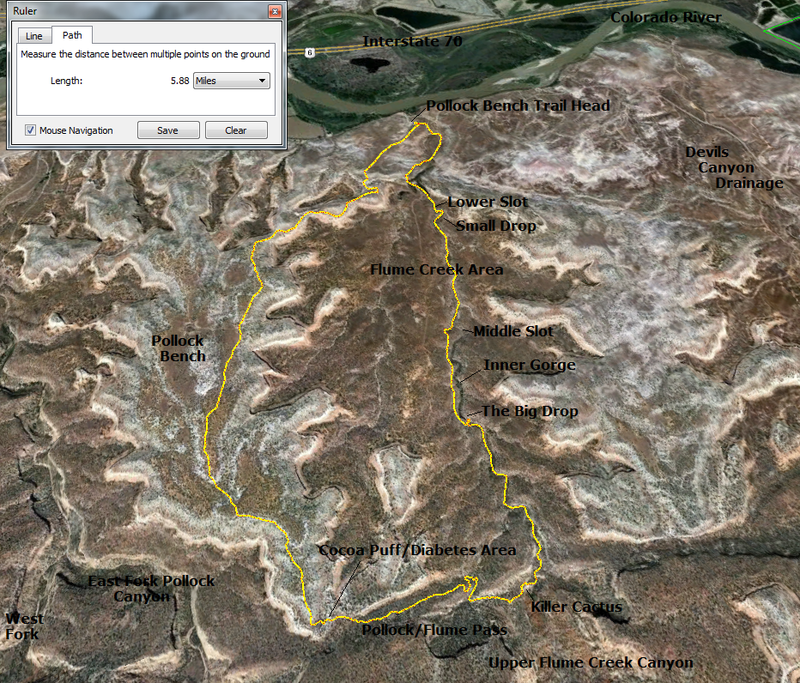 The trail turned from south to east at this point, through a natural pass between the Pollock and Flume drainages. Unfortunately, due to the the trail being on the north slope of the topography, we started to encounter icy patches. There were a couple of times that we came close to eating it as we trekked up the occasional steep slope. Shannon also occasionally dropped a Cocoa Puff on the ground in an effort to give the native animal population Diabetes. At least, that's what I assumed was going on. As we finally made it over the hump into the Flume Creek drainage, the sun did grace us with its presence for a little while. This gave me a nice opportunity for a photo op with a balancing rock. 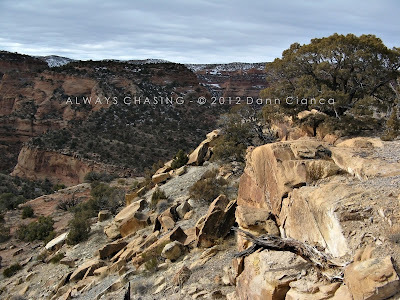 We continued along the "pass" between drainages and at one point, heard voices. It almost sounded like someone talking to a dog. We never did see anyone and it was a little creepy, but we never heard anything again. The trail finally descends into the Flume Creek Canyon at a natural boundary between the upper portion of the canyon (marked by an escarpment which can be seen on the map at the bottom) We took pause there to get a drink and have a snack. The sun was generous enough to hang around for a few minutes. Shannon touched a small cactus which pricked her. For some reason, I thought that I should touch it too. I'm sure you can imagine the result. The most unfortunate quality of this succulent is that the spikes have tiny hooks on their ends which get stuck on and or tear out your skin. I bled. We hit the bottom of the canyon at this point and followed the sandstone-walled wash for a while. Occasionally, a cottonwood tree would divide the otherwise narrow corridor. Eventually, the canyon widens out a bit and the trail leaves the wash.
At this point, we noticed that there was a deep and sudden chasm to the side of the trail. We investigated and found a big drop. I began to fantasize about possible waterfall opportunities come runoff. I worked my way over to the top of the drop to get a picture, trying not to slip on the ice and plummet into its depths. There was also a significant overhang. We flirted with the possibility of exploring the lower canyon, but had trouble finding access until a mile or so downstream. At that point, we were running a little low on time and Shannon was having a problem with her contact lens. We eventually made it to a place where we could access the wash again but followed it downstream from there, through a couple narrow areas and down one or two drops that I had previously discovered. Occasionally, we would try and balance on ice bergs frozen into small potholes. Occasionally, we would end up with wet feet. The rest of the hike back was uneventful. I do plan on returning to explore once again. I'd like to head all the way up the inner gorge to the drop, hopefully when water is running. I may have to wait until April or May, however. I'd also like to get back down into Pollock Canyon. I crossed the canyon (not an easy task!) on the way to the Rattlesnake Arches in the post mentioned above. So, I'm not quite done with this trail head just yet.